swisslet: what's cooler than bein' cool? I don’t think I’ve been cool at any point in my whole life. When I was around 8, I jumped a year at school and was generally in classes with people a year older than me. This was probably good from an academic point of view, but it meant both that I was young compared to my classmates and also generally considered a nerd because I was bright. I was made head of school at the age of 12 or 13, and I’d consider this to be the point in my life when I was the most mature. I sat exams and was awarded a scholarship to my next school and I was generally ridiculously sensible and with an overdeveloped sense of responsibility. It's been pretty much steadily downhill ever since. At my next school, as a scholar, I was streamed with the other bright kids and was generally held in disdain at a school where academic achievement was actively frowned upon. I was only averagely good at sport, so I was generally just the tall guy in the top sets with an older brother also at the school. In fact, for much of my first couple of years at this school, people didn’t even bother to call me by my own name and just called me “Little Dave” after my brother (who is actually shorter than me anyway, dammit!). Even worse than just being in the top sets for everything with the other dweebs, I also marked myself out by being so appallingly bad at maths that I was initially in set 5 (out of 6)….So I stood out because I was the guy who was smart but comically bad at maths. Perhaps even worse, I was also the guy in maths set 5 who finished his end of year exam with half of the 90 minutes still to go and when almost everyone else was still sweating over their answers. I handed my paper in and the teacher actually began to mark the two finished papers there and then, turning to put down the scores so far on the board. …You can only imagine how popular this made me with everyone else in the room, particularly when I then demanded to know what I’d got wrong. - the rest: Neither one thing nor the other. I was definitely in this group. Definitely not cool, but also not quite the total opposite end of the scale either. Not quite, anyway. It feels ridiculous to even type this, but we even sat like this at the meal table…. cooler guys and “pretty” girls at one end of the table, odd-balls at the other end and me in the middle. I did my best, but aged 17, I was very poorly emotionally equipped to strike up conversation with anything so alien as a GIRL. It’s one of my biggest regrets from this time of my life that I wasn’t nicer to people at the far end of the table / social scale. A few people I treated very badly, and I’m not really sure why. Generally, I just went with the flow of things and didn’t feel able to just take people as I found them. It sounds like a terribly limp excuse, but I essentially lacked the social capital to stand out; I was clinging on by my fingernails and didn’t feel that I had anything left over to help anyone else out. Pretty cowardly, but there you are. I was a teenager. This theme continued through university too, where I always felt slightly “other” because, having been to a boarding school since the age of 7, being away from my parents and being able to go out drinking and stay up late really wasn’t that big a deal. I wasn't cool here either, but nor was I yet comfortable with myself to be entirely happy in my own skin. I don't remember university all that fondly - either my bachelors or my masters degree. Both were fine, but they just weren't the massive milestones in my life that everyone would have you believe. I’m still not cool, but at least I’m old enough now not to care. I joined a choir because I like singing; I’m happy to listen to Taylor Swift, Iron Maiden and Bloc Party; “La Reine Margot” is one of my favourite films, but so is “Anchorman”. 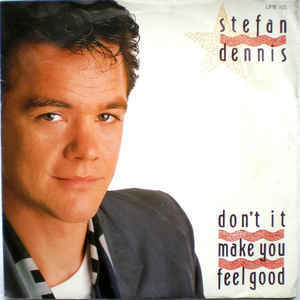 I’ve got a framed 7” single of “Don’t it make you feel good” by Stefan Dennis on my desk at work. My team gave it to me because they caught me earworming it out loud at my desk one day. I’m still pretty far from cool, right? I know some Austrian teenagers (young adults even) who think you, your iPhones, your Mini, your leather jacket, are cool. Remember when you took them for a drive round the bloc just because they wanted to ride around in your car? !